* * NOTE: has a necklace set (Tuscan necklace). If you want to purchase the two pieces, we inform you beforehand to deactivate the shipping costs on ETSY, which will run to our account. By its process of realization, it is a unique set, you will not find another like it in any other place. You will not be able to make an exact copy of this. The rhyolite is a volcanic stone. It is composed mainly of quartz, feldspar and sphalerite Blenda its gaseous cavities were filled with precipitates of silica giving rise to this cavity. 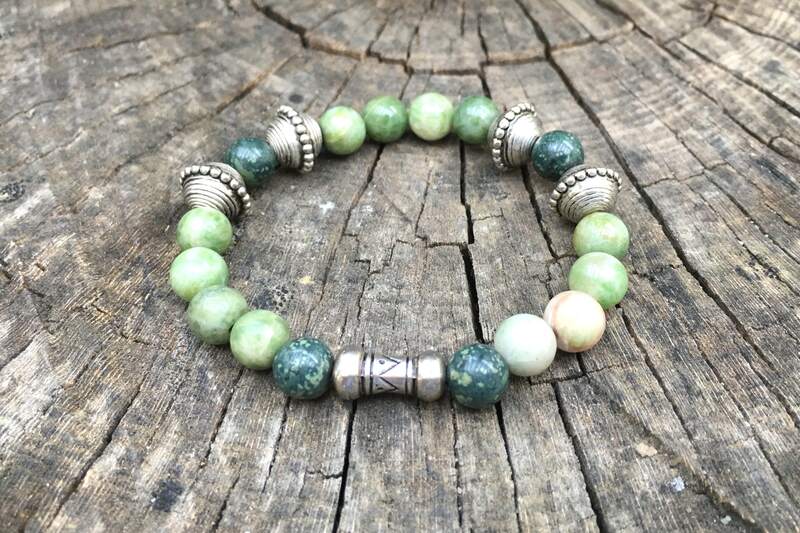 It is said that rhyolite reinforces self-esteem, strengthens soul, body and mind, and is intensely useful in exploring the full extent of "I", useful for past-life healing, emotional balancing, and activating the soul's potential and creativity. Its varied colors indicate change, variety and progress. The rhyolite helps to enhance the desire to progress in life, focusing on the present moment and solving what stagnates. It is a variety of the Moskovita, which belongs to the group of Muscovites. It is said to provide protection, helps to act in a resolute and calm way in case of problems, provocations, intrigues and attacks, helps to see things clearly and without remaining insensitive, stimulates acceptance and unconditional love, allows the Recognition of our failures, disperses insecurity and doubt about oneself. Muscovite stimulates ingenuity.